By performing a training session you give the body a stressful stimulus or ‘shock’ to disturb its homeostasis. After the immediate fatigue, the body responds by adapting during recovery so that it can cope with a larger training load next time. This is referred to as super-compensation, because when the body’s energy, muscular, and cardiovascular systems rebuild, they make themselves stronger and more capable than before the training took place. Training, especially High Intensity Training (HIT) is stressful, and deliberately so, as it provides a powerful stimulus for adaptation. The stressed state of the body persists for many hours, or sometimes days after the training stimulus has been applied. The rate of recovery depends on a number of factors, including quality of sleep (especially slow wave sleep), diet, and the level of training to which the athlete is accustomed. Whilst the body is stressed, the sympathetic ‘fight or flight’ branch of the nervous system is more active, and the parasympathetic branch is less active. Performance is gradually restored during recovery, with parasympathetic activity rising to a level above where it started, in line with the effect of super-compensation. Stress can come from multiple sources. It can be physical stress due to training intensity, or it can come from chemical sources such as poor nutrition or too much alcohol. Stress can also come from mental sources such as work or relationship stress. 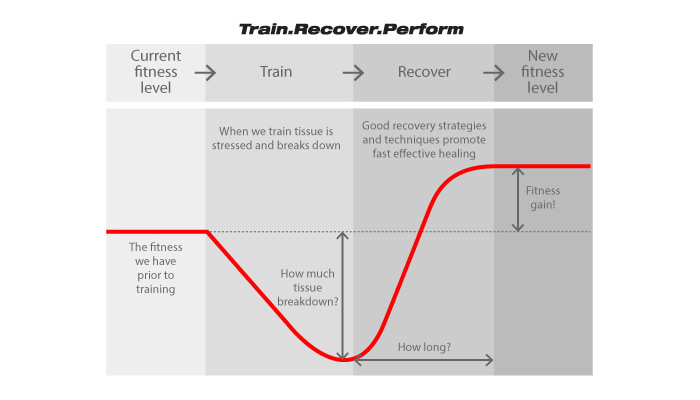 If the total quantity of stress gets too much, combined with too little (or ineffective) recovery, the downwards spiral towards overtraining begins. There are various ways to assess recovery, including subjective measurements of fatigue and muscle soreness, as well as exertion tests such as jump height. Resting Heart Rate (RHR) is tracked by many people, but the problem with RHR is that it’s an imprecise mix of influences and is not very sensitive, so that by the time it has risen 3 to 5 beats, it may already be too late. Heart Rate Variability (HRV) analysis is a way to observe the action of the parasympathetic branch of the nervous system that controls restoration and recovery. Originally used in the space program and later in elite track athletics, HRV is now a convenient and accessible way for anyone with a smartphone to check their recovery. You can then make training decisions based on objective data about how your body is coping with the combination of training and life load. 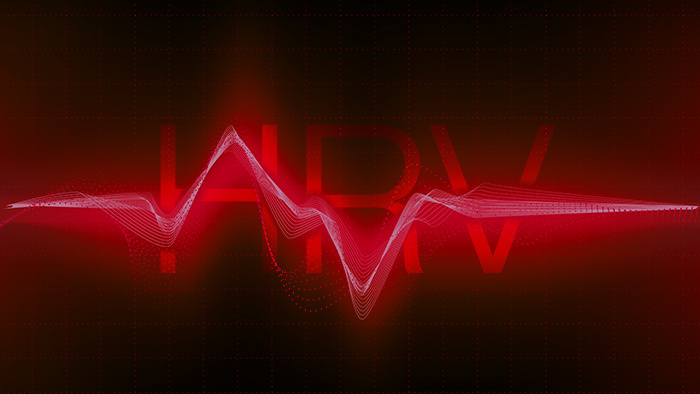 There are a number of good articles explaining what HRV is, but for the purposes of this article, it can best be described as the variation in heart rate that occurs when we breathe in and out at rest. Higher variability is better, and indicates a well-recovered, calm state, whereas persistently low values of HRV indicate chronic stress. HRV has to be measured at the same time of day to be meaningful, and measures should be compared to the individual’s baseline in order to show significant changes indicative of temporary imbalances. A daily HRV measure can most easily be thought of as an indication of training readiness. You can work harder during training (and will enjoy it more) if your body is in an unstressed state and are less likely to suffer overuse injuries. In a 2007 landmark study1, 30 club runners were divided into three groups. One was given a coach designed training program, one group served as a control, and the third had their training intensity guided by daily HRV readings. Although both coached and HRV groups showed improvements in maximum running speed (and speed at aerobic threshold), the improvements were significantly larger in the HRV group, which was also the only group to show an increase in VO2 peak. The HRV group also showed a smaller variation in improvement between group members. This implies that the individualization provided by HRV was more productive than trying to give all members the same prescription. Several studies have now shown HRV to be a strong predictor of successful training adaptation 2, and a rising HRV trend during pre-competition taper when training volume is reduced is a good sign. 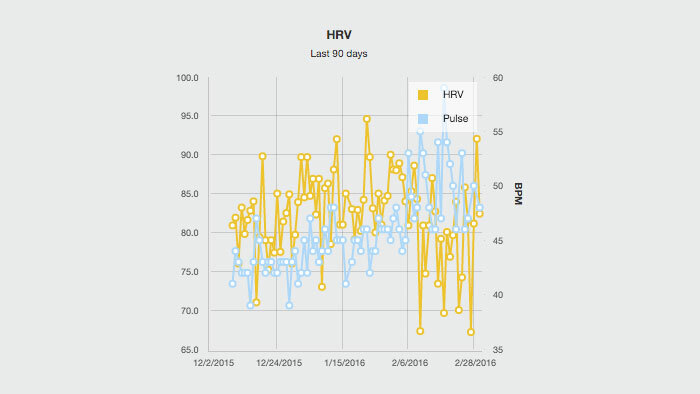 Will HRV Always Reflect How I Feel? Lifestyle stressors such as sleep quality, nutrition, mental and emotional stresses have an important influence on the total stress load the body is experiencing. High life loads means less capacity for training stress, so HRV will fall more quickly for a given TSS than if the life stress load is low. However, the accumulation of incomplete recovery will always lead to impaired performance and health, and a downward HRV trend over more than a week should not be ignored5. Thanks to some solid research and meta-studies6 HRV is now a well-understood phenomenon. Validated mobile apps7 with interfaces to training dashboards such as TrainingPeaks now allow keen recreational and professional athletes to understand just how their bodies are responding to training and make important adjustments to improve their performance and reduce downtime from illness and overuse injuries. ithlete is now compatible with TrainingPeaks. Sync your account now.